Mortgage Surveyors won't do a building surveys, or should that be can't do a building survey? We can help you with building control completion certificates, property surveys, building surveys, independent valuations, specific defects reports, home buyers reports, structural reports and just about anything else property related. Please do not hesitate in calling us for a free, friendly chat on free phone 0800 298 5424. Why have an Independent Survey? Caveat emptor means buyer beware and is why we as independent surveyors always advise you to have a survey carried out on the property. A survey will highlight any problems with the property which is not always something the estate agent will make you aware of. 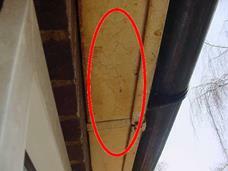 The photo to the right shows a problem that was found on a property we surveyed. Remember the Building Surveyor that you employ from us will be the only person working for you with your interests at heart. We recently spoke to a client who had had our services recommended. They explained that they had to have a valuation carried out by the mortgage company surveyor who recommended a building survey, but then went on to advise that they didn't carry out building surveys. Our client was amazed when he spoke to the bank surveyor's office (and they thought they were speaking to the actual surveyor) when they said they didn't want to do a building survey, as they specialised in valuations. Home buyers survey, what is it? The surveyor advised that they are happy to carry out a home buyers survey, which we would say is not appropriate for an older style property as this is. We also, upon further investigation, found it wasn't the Royal Institution of Chartered Surveyors home buyers but an in-house survey that had been prepared by the bank. Unfortunately, what we've seen of in-house home buyers type surveys is that they become nothing more than a tick list and are certainly not to the same quality as a building survey or structural survey, which is what our client thought as well. However, our client was persistent and advised that she wanted a building survey not a home buyers report and tried to persuade them to do a building survey and her words were they were simply not interested and advised her that she could have a home buyers report. She then went to other different surveys and received different advice as to what sort of survey she needed on this older property. Very often although surveyors are all called surveyors some have specialities, such as a valuation surveyor being a valuation surveyor specialising in the valuation market. 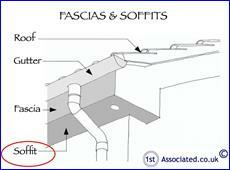 However, some also carry out surveys and a few, though not many, carry out building surveys. The problems arise where a client wants a building survey or the property should have a building survey according to the Royal Institution of Chartered Surveyors (RICS) and Which? magazine and consumer rights lobbying companies you should have a building survey, but unfortunately the mortgage company valuation surveying companies are set up to carry out valuations. The valuations that are carried out allow the mortgage company to get a mortgage on a property so you need to understand this is the primary motivation of a mortgage company owning a surveyors that carry out valuations, or should we say a building surveyor and valuation surveyor; there is no other motivation for a mortgage company to carry out a home buyers report or a building survey. Some, we feel, are forced into carrying out home buyers reports but most try to ignore or wrongly, and we would say dangerously, advise to have a home buyers report on older properties, which is very worrying. Our reports are certainly not ticklists! Throughout our survey reports we use many sketches that are unique to us and photographs to help explain things pictorially. We also use circles and ovals on our photographs and sketches to draw to your attention property problems so you are not left wondering where the problem is. We have surveyed many different types and eras of property and are more than happy to email you example surveys. Please call 0800 298 5424. We are so confident with our higher than average standards that we believe there is no other comparable survey available. If you truly do want an independent expert opinion with regard to valuations, mortgages, mortgage companies, surveys, building surveys, structural reports, engineers reports, specific defects report, structural surveys, home buyers reports or any other property matters please free phone 0800 298 5424 for a friendly chat.